World Council members of the International Laser Class Association gathered from around the globe on 18 – 19 November for the annual meeting. The split of the Asia-Pacific region into separate Asia and Oceania Regions has turned out to be very beneficial with more focused activity in each region drawing strong support. All four proposed rule changes received approval based on the Class Membership vote and, upon approval from World Sailing (now granted), will become part of the 2018 Laser Class Rules. There is a strong push to emulate the success of Europe in developing participation in the Laser 4.7 Class around the world. A proposal was adopted to allow only ONE excluded score when four or more races are completed at Laser World Championship for all events except the championships of the Olympic Classes (Standard Men and Radial Women). ILCA will be establishing a “Hall of Fame” to recognize individuals who have made outstanding contributions to the Class. The initial members will be recognized in 2018. Jean-Luc Michon stepped down as Chief Measurer for the Laser Class after more than 15 years of dedicated service. Aileen Loo was appointed to serve as Chief Measurer with a term to extend to the World Council meeting following the 2020 Olympic games. To maintain continuity, Michon will work closely with Aileen Loo. Michon was appointed to serve on the Technical and Measurement Committee. Aileen Loo was appointed to serve as the initial Chair of the Asian Region of ILCA, which was established at the previous World Council meeting by separating the Asia-Pacific Region into Asia and Oceania Regions. Loo will begin working to organize the Asian Region and establish a working organization. Under the ILCA Constitution, Loo will serve in this position until her successor is elected. Membership remained flat from the previous year at around 13,000 paid members, with small losses in some parts of the world offset by modest gains in other regions. The final accounts from 2016 were presented and approved along with the 2017 projected year-end accounts. The association operated below its budget for the year and ended FY 2016 with a small positive net income. Projections showed a positive net income is also expected for the year ending December 2017. 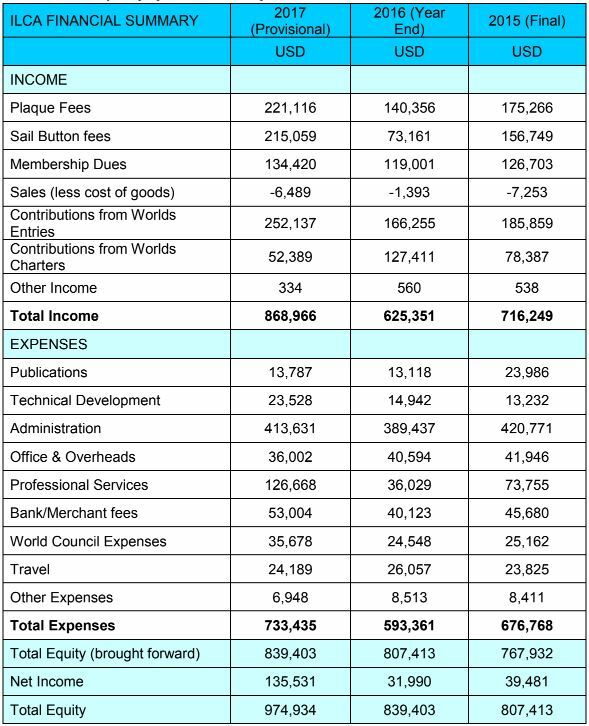 The World Council remains dedicated to managing costs while providing high-quality service to all ILCA members. This is reflected in the 2018 budget, anticipated to be just below break-even, which was approved as presented. 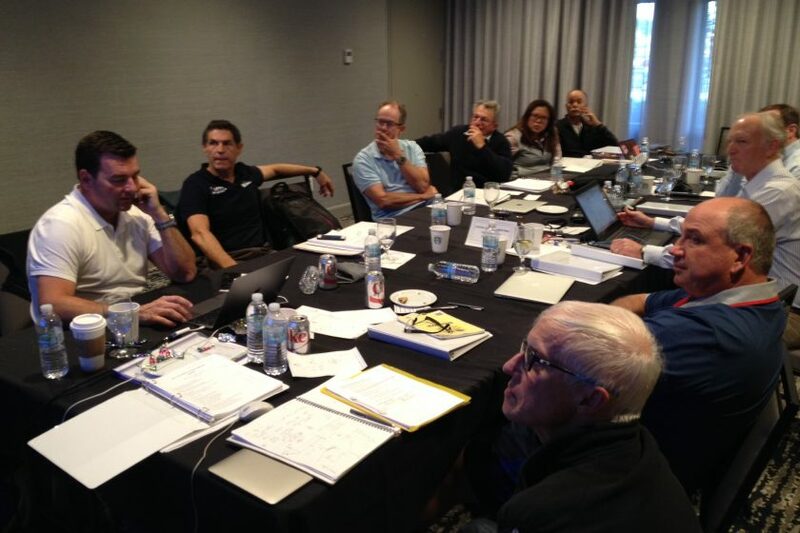 A review of the 2017 World Championships showed continued strong participation, the 2018 schedule is set and work is well underway to finalize the 2019 calendar. The Radial Men’s World Championship will have the distinction of serving as a feature event of Kiel Week in Germany. Later in the summer, Radial Youth will also be competing at Kiel. Poland will be welcoming the Laser 4.7 Youth and the Under-21 World Championships in Radial and Standard in Gdynia. The Masters will be competing in Dun Laoghaire, Ireland, and the Olympic classes will be participating in the World Sailing Championships in Aarhus where the first country qualifications for the 2020 Games will be awarded. Other than the World Sailing Championships in Aarhus, Applications and Entries for Laser World Championships will be handled through the ILCA on-line entry system. A report was received from the Technical and Measurement Committee (TMC) meeting held on the previous day including several proposed rule changes. One of the proposed rule changes will be to shorten the voting period for approving changes to the class rules from six months (a rule established before global electronic communication) to one month. The World Council approved a number of the proposed rule changes and these will be put before members for a vote in the near future. Clive Humphris reported that he had conducted audits of Laser builders Performance Sailcraft Australia and Performance Sailcraft Japan Laser during the year. The results of the in-depth testing and analysis show that build tolerances remain quite tight, resulting in a consistent product worldwide. Likewise, sample sails from several lofts were also compared and tested and all were found to be well within the specifications for construction and performance. Jeff Martin presented a report on the recent World Sailing Conference emphasizing submissions, discussion and issues of relevance to ILCA. Each Regional Chair then gave a report on local activities in their area. The next World Council Meeting is scheduled for November 2018.